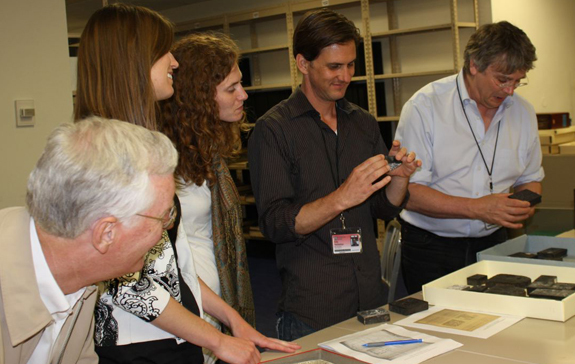 EBBA team members Charlotte Becker, Shannon Meyer, and Eric Nebeker consulting with curator Stephen Tabor (left) and Peter Stallybrass (right) while viewing the Huntington Library's rare cache of early woodblocks, May 22, 2012. EBBA's technological infrastructure is designed to support 600 dpi digital images, which is the current archival standard. Our images are derived from digital (600 dpi TIFF) color photographs of the originals whenever possible. In cases where re-photographing the originals was not an option, as with most of the Pepys ballads, we have worked from digitized microfilm. The Pepys microfilm was scanned by the company Softfile at 400 dpi (the archival standard at the time they were scanned in 2004), and are being presented in EBBA at a 33% reduced dimension at 600 dpi with a resulting average image size of 551 x 649 mm. for the larger, two-part ballads and 398 x 580 mm. for the smaller, single-part ballads. These dimensions are averages and thus do not reflect the wide range of digital image sizes EBBA delivers due to the variations in the photography of the originals. The ballad "originals" in many cases consist of more than one set of documents: the album book or books onto the pages of which the broadside ballads were pasted by their collector(s) and the broadside ballads themselves that were usually trimmed and, if large, often cut in two before being pasted into the albums. Not all collections of ballads are bound, however. For instance, the Britwell ballads at the Huntington Library, Pasadena, are loose ballads, and in some cases not even trimmed. Furthermore, while many collections are named collections—"Pepys," "Roxburghe," “Crawford,” etc.—some broadside ballads lie ingloriously in boxes with only the title of a Library's catalogue number to identify them. Once large TIFF digital images have been obtained by EBBA, the raw files are converted into PSDs in Adobe Photoshop by the EBBA technical team. In the process, misaligned images are straightened, and extraneous materials (border, rulers, color bars, etc.) are removed. In some cases, images are enhanced so that they will present the closest possible approximations of the original ballads. The PSD images are finally saved as JPEGs in three versions when all versions can be delivered: album facsimiles, ballad sheet facsimiles, and facsimile transcriptions. The last version is created based on strict rules of transcription.